Where and how was gold cooked? Welcome to the web page of the ASTRUm group. The ASTRUm group is rooted in the Atomic Physics Research Division of the GSI Helmholtz Centre in Darmstadt. The group is working together with the Helmholtz-CAS Joint Research Group and the SPARC Detectors Group. All three groups are lead by Apl. Prof. Dr. Yuri A. Litvinov. ASTRUm stands for Astrophysics with Stored Highy Charged Radionuclides. The group builds on the major strength of GSI Helmholtz Centre for Heavy Ion Research which offers access to stored and cooled stable and radioactive highly charged ions. Furthermore, a variety of trapping and storage-ring devices allow for selecting the atomic charge states and the kinetic energies of the ions to be studied. Within ASTRUm we employ this world-wide unique feature by addressing unsolved quests in modern astrophysics related to the question in the title: "Where and How was Gold Cooked? ", meaning the understanding of nucleosynthesis processes ongoing in our Universe. ASTRUm comprises four research goals which are briefly described below. Bound-state beta decay is an exotic decay mode barely observable in neutral atoms. In this beta-minus decay the electron is not emitted to continuum but occupies one of the free bound electron orbitals in a highly charged ion. The first observation of the bound state beta decay was done in the Experimental Storage Ring, ESR, in the early 1990s. 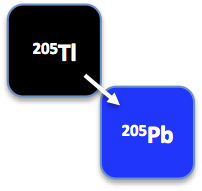 It is proposed to measure the bound-state beta decay rate of fully-ionized 205Tl, which is needed to determine the matrix element for the electron capture decay of the 2.3 keV excited state in 205Pb to the ground state of 205Tl. This matrix element is important for research of Solar neutrinos and of the very end of the slow neutron capture (s-) process. The measurement of the bound state beta decay was among the very first proposals for the ESR. However, it could not be conducted up to now. The corresponding proposal has been submitted to the General Program Advisory Committee in 2017 and has been ranked with the highest note "A". Thus the beam time is granted at GSI. Now the ASTRUm group prepares the experiment at the ESR. Proposal: E121 "Measurement of the bound-state beta decay of bare 205Tl ions"
Most of the elements beyond iron are produced via neutron-induced reactions. But there are about 35 proton rich nuclei between Se and Hg, which can neither be produced in the s-process nor in the rapid neutron capture (r) process. These nuclei are attributed to the p-process, which is believed to occur in Supernovae explosions and which requires high temperatures of about 2-3 GK. Such measurements in the astrophysically interesting energy range are already very challenging on stable nuclei, especially for isotopes heavier than iron. Only a small part of the nuclei involved in p-process networks, however, is stable. The majority of the isotopes crucial for the final p-process abundance are unstable. Since there is no chance of producing any reasonable targets from unstable nuclei of interest, it is proposed to determine the desired reaction rates in inverse kinematics. Here, a secondary beam of unstable nuclei, produced and purified at the GSI's Fragment Separator, FRS, is stored in the ESR or CRYRING at the required energy. The latter is ideally to be chosen directly in the Gamow window of the p-process. Such experiments are extremely attractive owing to high revolution frequencies in the ring, to the windowless pure internal hydrogen or helium targets, and to nearly unity detection efficiency of reaction products. Furthermore, electron cooling of ion beams fixes the beam energy which is essential if narrow resonances are looked for. After the proof-of-principle experiments with 96Ru and 124Xe proton capture reactions, a proposal to measure for the first time the proton capture rate on radioactive ions has been submitted to the General Program Advisory Committee in 2017. The proposal became the highest grade "A" granting its conduction in 2018/2019. Proposal: E127 "Measurements of proton-induced reaction rates on radioactive isotopes for the astrophysical p process"
Space-based x-ray observatories have detected numerous astrophysical x-ray burst events. X-ray bursts are interpreted as being generated by thermonuclear explosions in the atmosphere of an accreting neutron star in a close binary system. They are characterized by sudden enormous spikes in x-ray emission with repeating cycles of hours to days. In between bursts, hydrogen- and helium-rich material from the less evolved companion star is accumulated and gravitationally compressed on the star surface. The explosion begins with the hot CNO cycle. The breakout from the CNO cycle is most probably proceeds via the α-capture reaction 15O(α,γ)19Ne. The strength of this reaction rate determines the conditions for the ignition of the rapid proton capture (rp) process of nucleosynthesis. Great efforts have been made to determine the 15O(α,γ)19Ne reaction rate. However, direct measurements, at astrophysical important energies, were not yet successful. In particular essential is the key astrophysical resonance at E = 504 keV corresponding to a 3/2+ state at an excitation energy of 4.033 MeV in 19Ne. It is proposed to utilize the 21Ne(p,t)19Ne* reaction in inverse kinematics to populate the key resonance at 4.033 MeV in 19Ne and to measure the α- and γ- decay widths of the latter. For this purpose the enriched high-intensity 21Ne beam will be stored in the ESR and intersected with the internal hydrogen-gas jet target. The state of interest will be identified by measuring the energies and angles of the emitted in the reaction tritons. 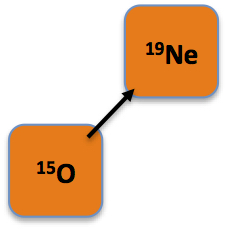 The feasibility of the experiment was shown in a short test by employing 20Ne(p,d)19Ne* reaction in the ESR. Proposal: E087 "Breakout from the hot CNO cycles in X-ray bursters: determination of the 15O(a,g)19Ne reaction rate via a (p,t) study on the ESR"
Measurements of nuclear masses and β-decay half-lives are broadly performed (planned) at basically all present (future) radioactive-ion beam facilities. The reason for this is that they are required in numerous nuclear structure applications and are also the essential nuclear physics input to any nucleosynthesis calculations. In first order the masses determine the energetics of a synthesis process and thus its location on the nuclear chart. The lifetimes determine the speed of the process and thus influence the final element abundances. Storage ring mass spectrometry is well established. The masses are determined through precision measurement of their revolution frequencies. 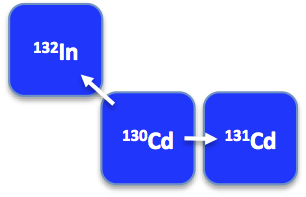 A large number of nuclides can be investigated at the same time. Employing highly sensitive Schottky detectors for non-destructive frequency and intensity measurements will enable simultaneous measurements of atomic masses and nuclear lifetimes. The high resolving power allows for resolving metastable nuclear states. It is emphasized that there is no other experimental technique, which can compete with our measurements combined in terms of the efficiency, sensitivity, speed and precision. This research at the future FAIR facility is pursued by the ILIMA (Isomeric Beams, Lifetime and Masses) collaboration. A dedicated proposal to address properties of neutron-rich isotopes in the hafnium (Z=72) region, specifically focusing on the search for new exotic isomeric states, has been submitted to the General Program Advisory Committee. The results on the proposal ranking are expected soon. Proposal: E122 "Long-lived isomers in the Experimental Storage Ring: study of 186-188Hf"
Consolidator Grant 682841 "ASTRUm" receives funding from the European Research Council (ERC) under the European Union's Horizon 2020 research and innovation programme.